Who is Makan Delrahim, the Trump antitrust chief? Makan Delrahim, the Justice Department's top antitrust cop, has been on the job for all of six weeks and he's already in the thick of one of the largest media deals ever. Delrahim is in charge of evaluating whether corporate mergers violate antitrust laws, which seek to prevent unfair competitive practices that could harm consumers. And Delrahim has a lightning rod on the table: AT&T's pending takeover of Time Warner, the parent company of CNN, HBO, Warner Bros., and a host of other content producers. When the deal was announced in October 2016, then-candidate Donald Trump vowed to stop it. But Delrahim was quoted at the time saying, "I don't see this as a major antitrust problem." "This is more of what we call a vertical merger -- a content with distribution -- rather than two competitors merging," he said in an interview with BNN. "I think it'll get a lot of attention, but I don't see this as a major antitrust problem." So why did Delrahim change his mind about the antitrust impacts of the deal? That's surely what AT&T and Time Warner executives would like to know. 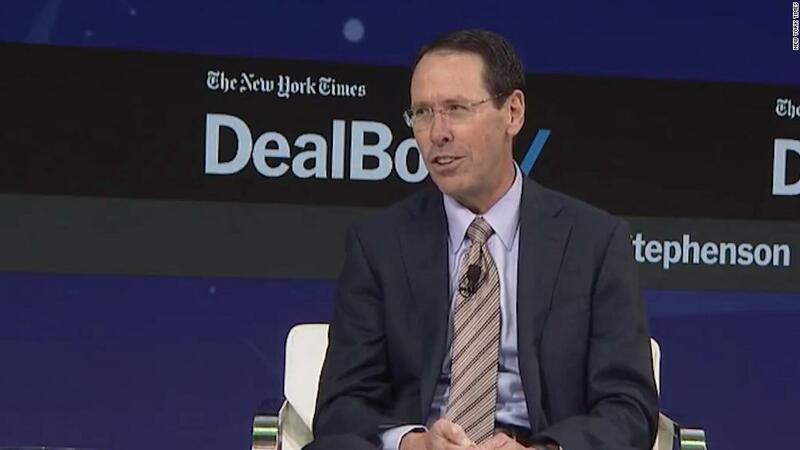 AT&T chief executive Randall Stephenson had his first face-to-face meeting with Delrahim on Monday. That's when Delrahim outlined the DOJ's argument that the acquisition would cause anticompetitive harm, according to sources familiar with the matter. The two men discussed divestitures that might satisfy the government's concerns, the sources said. The meeting did not go well. The fallout from it sparked headlines that the deal could be blocked because of President Trump's disdain for CNN. At the DealBook Conference in New York on Thursday, Stephenson said the meeting with Delrahim was helpful because "we both learned a lot about where each other are." "So now we continue this process to see if we can get to a negotiated settlement," Stephenson said. The New York Times reported earlier this year that Trump advisers allegedly discussed in secret how they could use White House authority to influence the deal -- potentially as leverage against CNN, whose coverage has frequently drawn Trump's ire. CNN has not independently confirmed that reporting. Those concerns are front and center now that Delrahim's antitrust division is considering going to court to try to block the deal. But the Justice Department and Delrahim have said that's not the case, and there have been suggestions that DOJ lawyers have simply concluded that the acquisition of Time Warner, if approved, would give AT&T too much power. And in the wake of Wednesday's headlines, Delrahim said in a statement, "I have never been instructed by the White House on this or any other transaction under review by the antitrust division." Anything the Antitrust Division does from here on out related to this deal will undoubtedly be met with widespread scrutiny. Here's everything you need to know about the man in charge of it. Makan Delrahim, 48, is an Iranian immigrant who moved to the United States when he was about 10 years old. He is a self-described conservative. He has three degrees: a bachelor's degree from UCLA, an M.S. from Johns Hopkins, and a J.D. from the George Washington University Law School. Delrahim's resume includes stints in the public and private sector. He worked as a top staffer and lawyer on the Senate Judiciary Committee from 1998 to 2003, and then served as deputy assistant attorney general in the antitrust division during the George W. Bush administration. In 2005, he left government and worked for more than a decade as a lawyer and lobbyist at Brownstein Hyatt Farber Schreck, a corporate law firm. Delrahim's client list included AT&T, Apple, Johnson & Johnson, Microsoft, Google and Intel, according to public documents. Delrahim joined the Trump White House in January as a deputy assistant to the president and deputy White House counsel, a position that did not require Senate confirmation. In March, Trump announced that he would nominate him to head the Antitrust Division. But the Senate didn't move on the nomination for months. Reuters, citing unnamed sources, reported that Senator Elizabeth Warren, a Democrat, had held up the nomination. Warren reportedly met privately with Delrahim in September, seeking assurance that he wouldn't allow Trump to interfere with his merger reviews. On September 27, Delrahim was confirmed by the Senate by a vote of 73 to 21. Observers said they expected that Delrahim would reflect the Trump administration's business-friendly approach. With Delrahim in charge, "antitrust enforcement -- at least at the DOJ -- is likely to reflect the type of restraint and faith in the free market that we have witnessed in prior Republican administrations," lawyers for Steptoe & Johnson LLP wrote in an analysis published online earlier this year. Delrahim was involved in one of the most contentious antitrust fights in the media industry. Public filings show that in 2009 and 2010 he lobbied on behalf of Comcast, which was acquiring NBC Universal. Critics were wary of allowing a distribution company (Comcast) to control a content and programming company (NBC). Among their fears was that Comcast (CCV) would thwart competition among online streaming services by refusing to offer NBC content to other online platforms, such as Hulu or Netflix (NFLX). The Federal Communications Commission and the DOJ ultimately approved the deal -- with stipulations. Delrahim also worked as a lobbyist on behalf of Anthem (ANTX) during its takeover bid for Cigna (CI), Pfizer (PFE) during its acquisition of Allegra, and T-Mobile (TMUS) during its MetroPCS merger. During an interview with the New York Times in April, Delrahim described his approach to antitrust regulation: "Just like any other industry, if there is wrongdoing, we would investigate," Delrahim told the outlet. But "federal laws should not be used as a fishing expedition by government." Delrahim's October 2016 interview about the AT&T deal -- in which he said "I don't see this as a major antitrust problem" -- was with the Canadian network BNN. During the conversation, he even suggested he did not think the AT&T-Time Warner deal should be more troublesome than the Comcast deal he fought for. "It doesn't raise the same challenges as some of those other transactions.," he said. Politico and the FT, citing anonymous sources, have reported that Delrahim has changed his view since taking office. Critics have said it raises the prospect of White House influence. "Maybe he has had a legitimate change of heart about the arrangement since inspecting the deal more closely from his perch at the Justice Department. But his new boss has left him with some troubling appearances," New York Times media columnist Jim Rutenberg wrote in Thursday's Times. Delrahim promised at his Senate confirmation hearing in May that "politics will have no role" in deal reviews under his leadership. "The independence of the decision -- in prosecuting and reviewing mergers as well as other conduct -- is a serious one that should be free from any political influence," he said. During a meeting earlier this year, Delrahim promised Democratic Senator Richard Blumenthal that he would alert him "any time the White House initiates an inappropriate communication with you or anybody in the Antitrust Division," according to The Wall Street Journal. Sources also reportedly told the Journal that Delrahim assured Blumenthal that the White House had not attempted to influence his view of the AT&T-Time Warner deal. A long time colleague of Delrahim's who says he is a liberal told CNNMoney that he can't imagine that Delrahim "would engage in any type of vigilante justice to help the president in the deal...That's just unfathomable to me." The source, who spoke on the condition of anonymity, added that Delrahim likely changed his mind after more closely inspecting the AT&T-Time Warner deal. The source explained that the conservative approach to antitrust enforcement prefers requiring companies to spinoff certain chunks of their businesses, rather than putting in place "behavior requirements" that the government would have to police indefinitely.